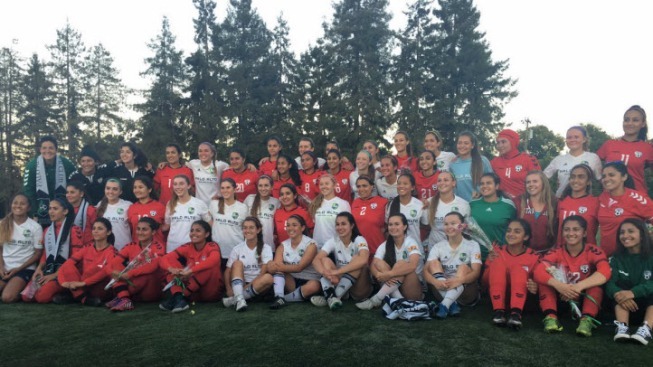 Afghanistan's national women's soccer team began training in the Bay Area this week, playing a friendly against a Palo Alto club team Wednesday as it prepares for a major tournament in India. The existence of the team alone is quite an achievement. It was once forbidden for women to play sports in Afghanistan. When the soccer team formed in 2007, the Taliban tried to shut it down. Players received death threats. Today, the Afghan players say the conditions are getting better. "Now, it's very easy for me because the football federation established very good football fields," Afghan player Hajar Abulfazl said. The team chose to practice in the Bay Area because of the region's large Afghan contingency. On Wednesday at the Cubberly Community Center field in Palo Alto, many supporters from Fremont got to see their home country's team up close, taking on 17- and 18-year-olds from the Palo Alto Soccer Club. "So now to see these women, I'm very grateful," said Rona Popal of the Afghan Women's Association. The friendly was Afghanistan's first match of the year. On the other side, Palo Alto players felt equally privileged to be on the field with the historic team. "It's right at the top," Amanda McMaster said. "I've never really gotten an experience like this." Most of the Afghan national team players were once refugees and now live in Europe. They're goal is to inspire young girls in their home country. "We want them to see that if girls like us can do it, they can do it," said Shabnam Mobarez, captain of the Afghanistan team. "We want them to get out of their comfort zone, get out of their homes and get into sports." The team is coached by former U.S. women's player Kelly Lindsey, who couldn't be prouder to help in its journey. "Because when you grow up in a place where you can have anything, it's really nice to see a group of girls come out here and fight for what they want in life," Lindsey said. In the end, lifelong friends were made on the pitch. And the score didn't matter.